The real advantage of cloud applications is effective cooperation. Use MiniCRM in the office and your home, or take it on the road with you. It is available on PC, notebook, smartphone (iPhone, Android, Windows Phone) and tablet. Sync your customers and tasks with the address book and calendar of your phone. Access MiniCRM directly from GMail. The relevant CRM card of your customer is displayed below every message. 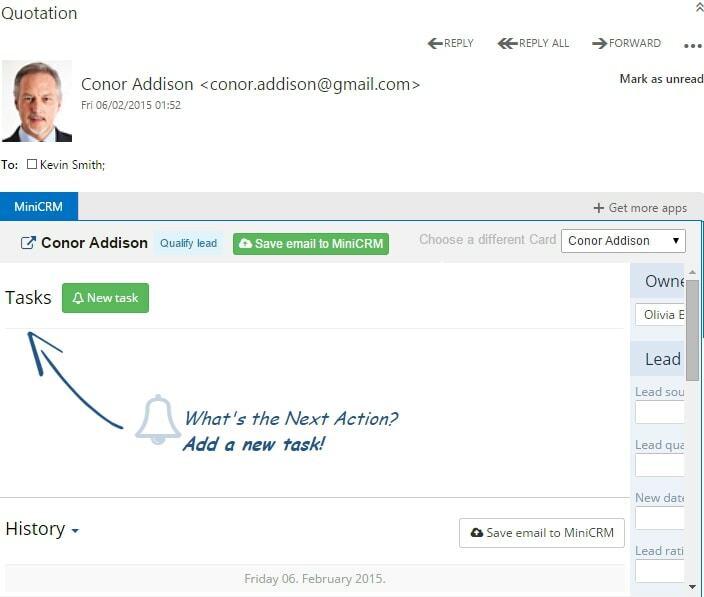 No need to spend time on searching for the sender in your CRM. Archive important emails to MiniCRM with a single click. 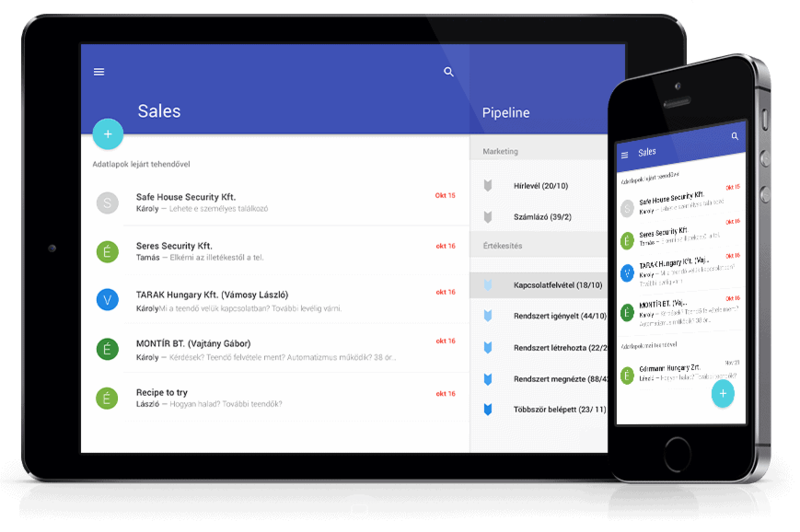 Manage your tasks and customer data without leaving GMail. 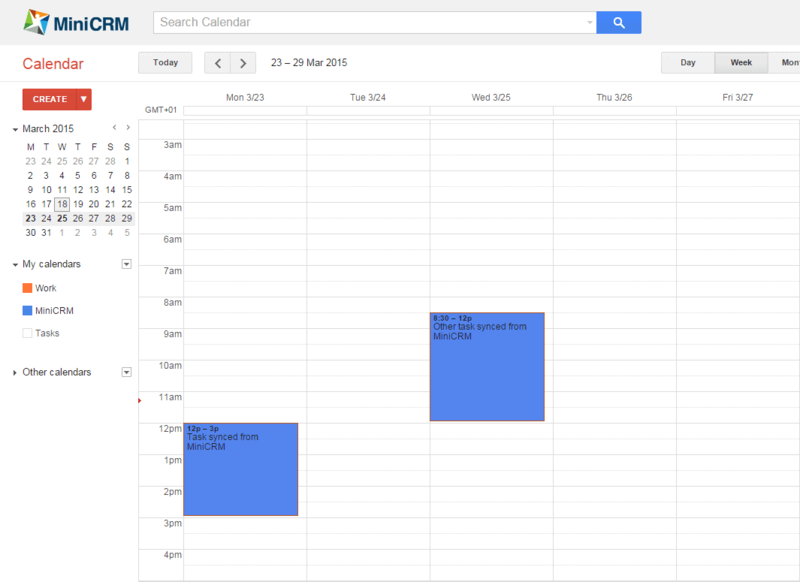 Sync your tasks in MiniCRM with Google Calendar and see them as a calendar event in a day/week/month view. The relevant MiniCRM card can be accessed directly from your calendar. If you change a Google Calendar event, the task connected to it is updated as well. Load your filters into Google Spreadsheets. Whenever you open a spreadsheet, it shows current data from MiniCRM. No need to manually export or copy/paste information to update your custom reports. Create detailed reports and pivot tables; and everything that you are used to having in your favourite spreadsheet application. Access MiniCRM directly from Outlook. The relevant CRM card of your customer is displayed below every message. No need to spend time on searching for the sender in your CRM. Archive important emails to MiniCRM with a single click. Manage your tasks and customer data without leaving Outlook. Integrate Google Analytics into your website so the lead source appears in MiniCRM. Display call history on the relevant customer’s card by using the MiniCRM Android app. Integrate LiveChat with MiniCRM to save all conversations with your customers automatically. By integrating Shoprenter, registrations will automatically appear in MiniCRM. Sync your Facebook with MiniCRM to save all registrations automatically in the system. Insert files into your MiniCRM templates directly from Dropbox.